Last year, Monsanto introduced new varieties of cotton and soybean plants that were resistant to the well-established herbicide, dicamba. New formulations of the chemical have been devised specifically for use on these engineered crops. Many farmers in the midwest and southern U.S. began planting these varieties in earnest and spraying them with the herbicide. However, other farmers in these regions found that their crops, including non-dicamba resistant soybeans, began showing the signature symptoms of dicamba injury, even if dicamba was not being used in adjacent farms. The evidence began to build that there was significant movement of the herbicide from the application site that damaged crops potentially miles away, sparking great tension in the agriculture industry. The New York Times implies that big agrochemical companies are yet again shoving their pesticides and GE crops down our throats, and bullying anyone who challenges them. Monsanto, on the other hand, blames farmers entirely for the off-target movement problem. The company says growers aren’t following dicamba’s label instructions when applying the herbicide. So who’s right, the agrochemical giant or farmers? Well, both are. Some farmers may have misused dicamba, inadvertently or by design. But the companies manufacturing dicamba-based herbicides (BASF, Dow-Dupont and Monsanto) fumbled the rollout of their new products and reacted poorly to expert criticism. To understand the current dicamba controversy, we need to start with a brief review of another herbicide, glyphosate. When glyphosate, the active ingredient in Monsanto’s Roundup, entered the market in 1974, farmers applied it sparingly – mostly to control weeds in row middles as well as in other places around their properties. Glyphosate is a non-selective herbicide – it kills all plants – so spraying the crop haphazardly is a huge mistake. The limited use of glyphosate-based products kept the development of glyphosate resistant weeds in check for nearly 30 years. With the introduction of Roundup Ready crops in 1996, however, the acreage of glyphosate tolerant crops increased dramatically. Glyphosate soon replaced other herbicides on the farm, and the first reports of weeds resistant to the chemical appeared later that year. Since then, at least 38 weed species have developed resistance to glyphosate. The herbicide is still very effective and in widespread use around the world, but scientists and farmers are trying to devise new strategies to stay ahead of constantly-evolving weeds. In practice, that means mixing glyphosate with other herbicides that kill weeds through a different mechanism, or using glyphosate for one year and then switching to another chemical the next. This is where dicamba enters the story. Dicamba is a broadleaf herbicide and was approved for use in crops in 1967. It works by mimicking a hormone called auxin, which controls cell elongation and division, and other processes that contribute to plant growth and development. The targeted plant takes up the herbicide and essentially dies from unbridled, non-coordinated cell division, metabolism, and expansion. When properly applied, dicamba is a clever weed management tool. Unfortunately, dicamba is extremely volatile; it can vaporize after application. Wind and temperature inversions can carry it to adjacent plants or even miles away, where it can impart its herbicidal effects. Volatilization is affected by the pH and other ions present in the mixture, the nozzles used to apply it, the boom height above the crop, the temperature, humidity, wind and temperature gradients above the ground. In short, there are many factors that influence volatilization and off-target movement, which has led to endless claims of others’ negligence in connecting responsibility to the tremendous crop losses. Monsanto first released a variety of dicamba-resistant cotton in 2016. The industry prefers to develop herbicide-resistant crops instead of new herbicides, because it’s less expensive and presents fewer regulatory hoops to jump through. Nonetheless, Monsanto knew the older dicamba formulations were too volatile and would cause drift, so they developed a new product with “vapor grip” technology that would minimize the problem. Monsanto and several smaller regional companies sell the new seeds. Monsanto, DuPont and BASF sell new formulations of dicamba to use in concert with the GE crops. Working in combination, the new seeds and herbicide formulations shouldn’t have caused a problem. However, Monsanto released the dicamba-resistant seeds before the new herbicide formulations were available. Farmers could buy the seeds but not the new dicamba formulations. Monsanto explicitly instructed growers not to use the older, more volatile formulations. But some farmers, losing a battle to glyphosate-resistant weeds, illegally sprayed dicamba products on their new crop varieties, where it worked quite well. However, the tell-tale symptoms of dicamba damage began to show up on other farms. Various crops have remarkably different sensitivities to auxin-like herbicides, some showing the signatures of dicamba damage with 1/20,000 of the application rate. Much of the crop damage occurred in Arkansas, and the state may ban dicamba. But farmers in dozens of states have reported crop damage to the EPA that is consistent with dicamba volatilization. Damage has been reported on both conventional and organic farms, including peaches, vineyards, tomatoes, and in huge acreage of non-dicamba resistant soy. In total it is estimated that 3.6 million acres of soybeans have shown symptoms. The situation is further complicated because it is unclear if minor symptoms (like a curled leaf) have anything to do with yield loss, where in other cases yield losses are clearly evident. The situation has ignited a heated debate. Monsanto and farmers who have benefitted from the company’s new products are facing off against university weed scientists, along with farmers whose fields have been damaged. The company maintains that their new dicamba formulation is not to blame for the damaged crops. Citing the studies they submitted to the EPA, Monsanto claims that their new dicamba formulation is 90 percent less volatile than earlier versions of the herbicide and causes minimal drift. They say the damage is likely due to “illegal use of unapproved products and potential product contamination.” For instance, it has been well demonstrated that residual fertilizers in sprayer tanks can significantly favor dicamba volatilization. But some experts aren’t buying that explanation. They say that Monsanto doesn’t have enough data to vindicate their dicamba formulation. The company’s new herbicide is less volatile, critics concede, but “...low volatility is not the same as no volatility,” and in the large amounts used, if a tiny fraction volatilizes and moves, we might expect widespread reports of damage. These scientists further point out that “symptoms in many affected fields do NOT follow patterns associated with physical drift or contaminated application equipment,” and volatility remains the most likely source of the crop damage. Dicamba producers have not backed down, though. They say the off-target movement of their herbicide is caused by “inadequate buffers, unapproved nozzles, and wrong boom height.” The companies say they will happily train farmers to properly use their products. They have provided proper nozzles and other equipment. They have also offered to send agronomic specialists to review any damage farmers believe was caused by their products. But Monsanto has attacked some of its critics because these scientists are employed by the company’s competitor Bayer. As consultants to another chemical manufacturer, these researchers have a financial stake in the outcome of the situation, so their testimony is suspect, Monsanto claims. The mainstream press has been too conspiratorial in their coverage of this situation, and they’ve overlooked some important facts we should all keep in mind. First, crop damage caused by dicamba drift predates Monsanto’s herbicide-resistant crops by almost 50 years. The phenomenon was first described by scientists in 1966. The introduction of glyphosate-resistant crops in 1996 greatly reduced the use of dicamba and, as a result, crop injury from dicamba for two decades. The media hasn’t reported that, however. Monsanto released dicamba-resistant seeds before the new herbicide formulation because they anticipated the EPA would approve the low-volatility dicamba before the growing season started. Farmers would have had access to both the seeds and herbicide in that case. But the federal agency delayed the approval to review public comments. The seeds were produced and ready to go, so they were sold before the new herbicide formulations were available, but Monsanto didn’t tempt “...farmers to use older versions of dicamba,” as the media has suggested. 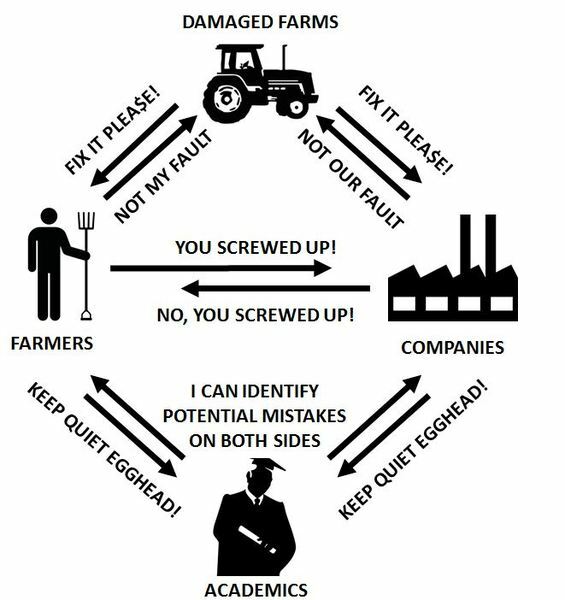 It is hard to give farmers a solution to a problem and expect them not to use it. Moreover, the industry hasn’t collectively thrown farmers under the bus. Monsanto has been far too dismissive of concerns, but DuPont and BASF have been more responsive to complaints from farmers that the new dicamba formulations were damaging their crops. Additionally, all three companies “voluntarily agreed to label changes that impose additional requirements” on the use of dicamba, according to the EPA. The story of evil corporations trampling small farmers for profit is compelling–but it’s not entirely true. Observations have been made by university scientists and independent agronomists that clearly denote the off-target damage, drawing ire from farmers and companies alike. At issue are the damages that demand compensation, and sorting out the liability of the company vs. the potential cases of off-label use, inappropriate timing of application or unclean tank mixtures that contribute to volatilization. The latter cases are likely to be rare, though. As independent arbiters, extension faculty find themselves in a difficult situation, as their expert observations potentially drag universities into the frey. Their websites feature conservative interpretations of the situation, and remain the most trustworthy sources of information on this situation. The dicamba situation is a volatile one. It presents a nightmare scenario where an agricultural product has led to off-target effects. When consumers are asking questions about agriculture, it only fortifies the claims of agriculture and biotechnology critics that claim these technologies are rife with unknown risks. In reality, the risks of dicamba volatilization were well documented, but not enough steps were taken to mitigate their occurence in wide application. Politicians and activists want to halt use of the technology, but this would be excessive. Rather, dicamba requires careful handling and further refinement. Manufacturers need to continue to improve the application formulae, study application conditions, and minimize off target damage to odd exceptions spawned from unusual weather events. Moreover, steps should be taken to compensate farmers for losses and earn the trust of ag producers and the general public. In the end, this is a good technology that clearly was not ready for prime time. The silver lining is that independent experts quickly worked with farmers to identify the problem. Farmers, universities, the EPA and ag companies are now working (sometimes together) to solve it. It is this kind of response that will ultimately make the use of any agricultural technology sustainable and provide the social license to use it. Cameron English is a freelance science writer and podcast host. He covers nutrition, public health, biotechnology and occasionally other topics. He lives in California with his fiance and lab-cocker spaniel puppy. Visit his website and follow him on Twitter. Kevin Folta is a professor in and chairman of the Horticultural Sciences Department at the University of Florida, Gainesville. He got his Ph.D in Molecular Biology from University of Illinois at Chicago in 1998 and worked at University of Wisconsin before settling in at University of Florida. Kevin hosts the Talking Biotech podcast.